Hey, don’t we already have one of these? 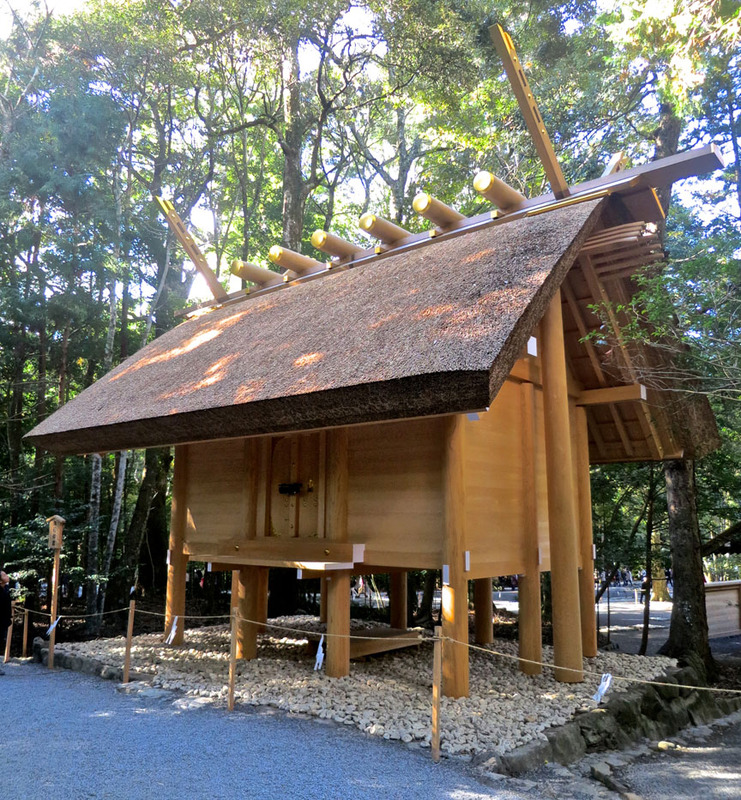 The god of rice’s building at the Ise Shrine sits next to a vacant lot. Or, actually, a construction site. Because every twenty years, a replica of the rice god’s shrine is lovingly built right next door. In the twentieth year, the god of rice is moved from the old shrine to the new, and the old shrine is dismantled. Then the construction starts again. But why? I was really curious about this, so I went on a bus tour with two Japanese friends to find out! So, the first reason is practical: if you only rebuild the rice god’s house every few centuries (after it burns down, as they inevitably do), there might not be anyone alive who knows how to build it. If you rebuild it every twenty years, you not only have a perfect example of how it’s supposed to look, the guys who built the last one can train the ones who are building the current one. Make the next one just like this! (This is just a storehouse, not a shrine, but the shrine buildings are built in this same style). But there’s another reason too. 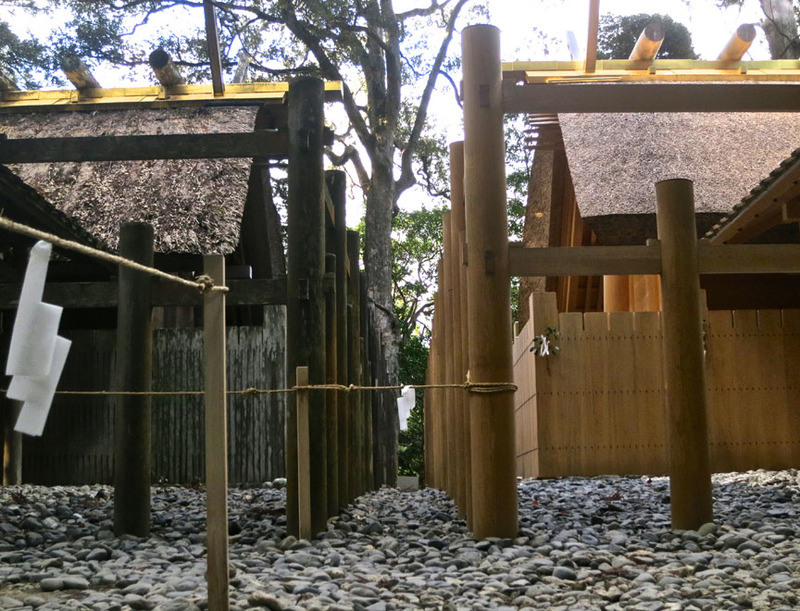 You’re probably wondering why it takes twenty years to build a plain wooden shrine, even if the roof beams are hand-notched and the roof hand-thatched. It’s because every step is accompanied by a ceremony that has been performed in exactly the same way since the year 690 CE. One year might be the ceremony for raising the roof beams, another might be the year for making new offering dishes. And everything is done exactly the way it was done in 690, right down to the way the fire is kindled for the kiln! No matches, lighter fluid or flamethrowers allowed! 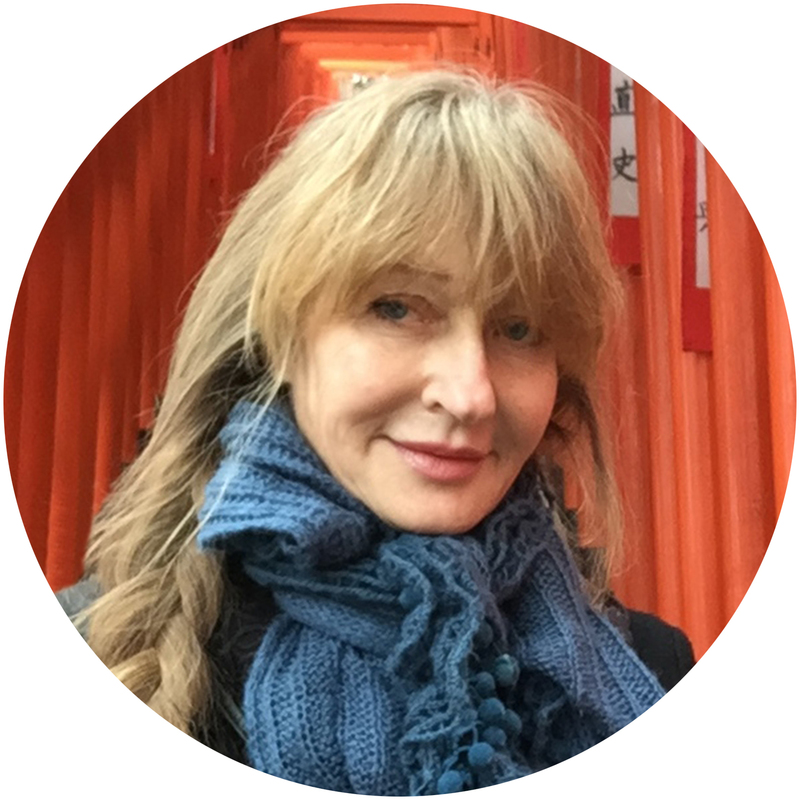 Another amazing thing is that the rice god isn’t the only one who gets a new house every twenty years – every sacred building is rebuilt and torn apart in the same way, right up to and including the Grand Shrine, dedicated to Japan’s ur-goddess, Amaterasu. Kind of challenges what’s meant by “antiquity,” doesn’t it? The exact same buildings have stood on that ground for 1323 years. The materials might be new, but everything else about them is preserved better than in any museum. I found myself thinking of Richard Dawkins’ idea about the River Of Genes: how genes are combined and recombined in every generation, “flowing” from one body to the next, throughout time. The bodies are new, but the genes are old. 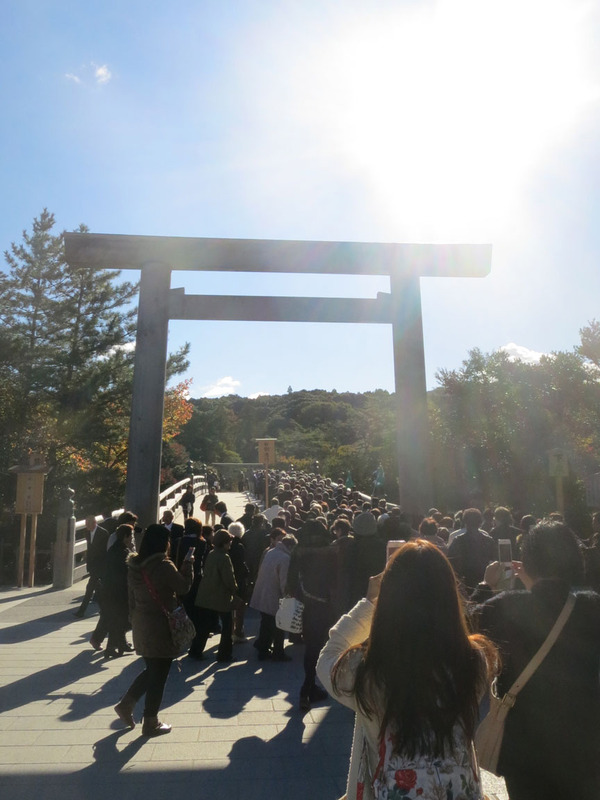 When you think of it that way, the Ise Shrine is sort of like a cultural River Of Genes, isn’t it? 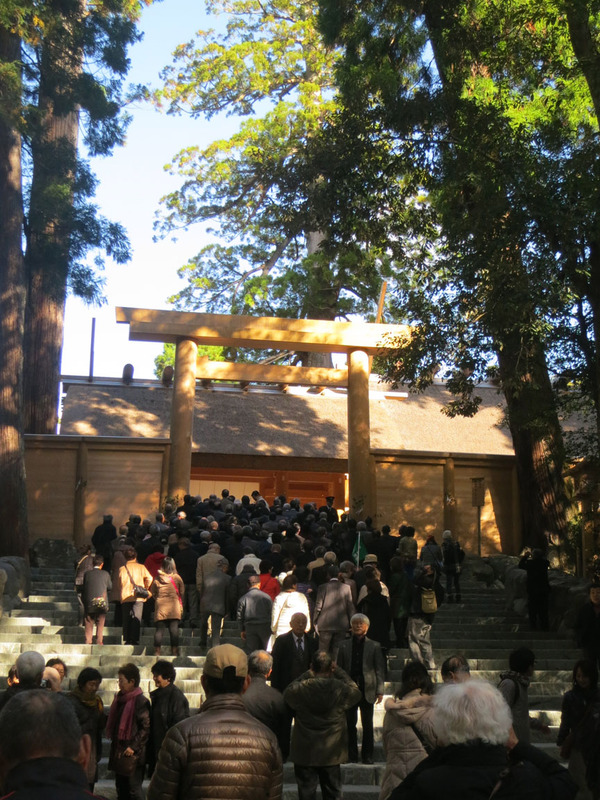 The entrance to the Grand Shrine. You aren’t allowed to take pictures beyond that big torii gate, but there’s not much to see anyway. Just a sort of wooden booth, an offering box, and a long wooden fence enclosing the parts too sacred for anybody but priests (and VIPS). Crossing the bridge to the Grand Shrine at pilgrim rush hour. 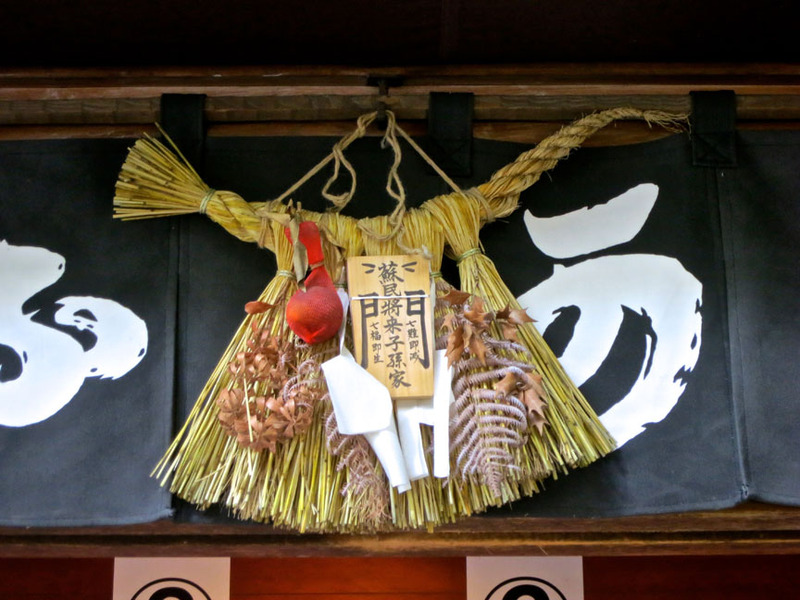 This Ise Shrine’s distinctive rice straw charm (shimenawa) hangs over a business on the nearby shopping street. 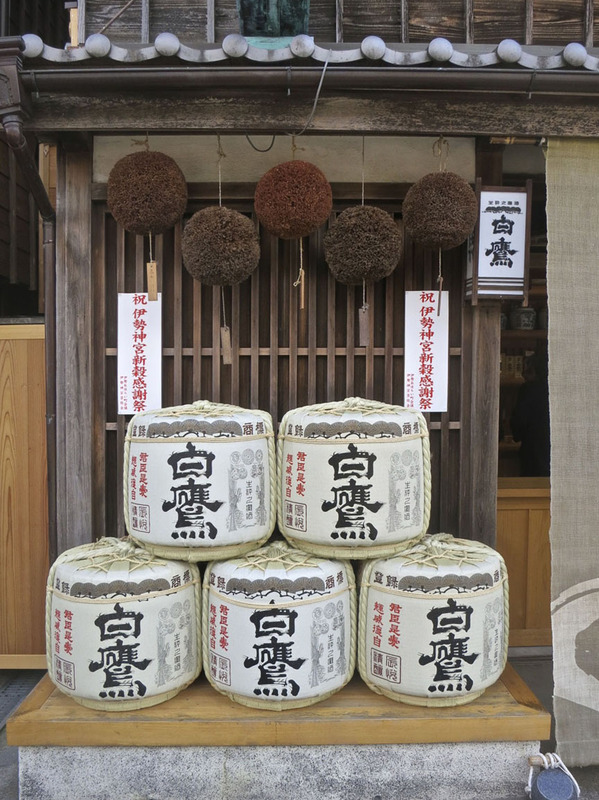 Locally brewed barrels of sake sit outside this liquor store, waiting for their accompanying cryptomeria-needle balls to turn color and tell when it’s ready to drink.